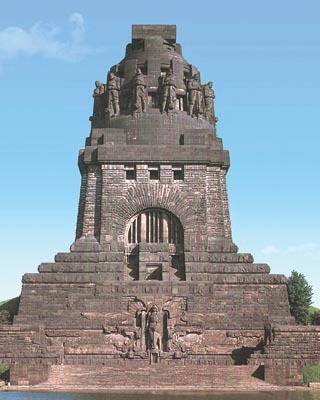 The Volkerschlachtdenkmal on the edge of Leipzig, Germany, is reputedly the most massive memorial in Europe, constructed from over 300,000 tons of red porphyry and concrete. Completed by 1913 to commemorate the defeat of Napoleon on the same site a century earlier, the architectural design was by Bruno Schmitz. His overall scheme was predictably nineteenth-century and somewhat ponderous, but by 1905, when the time came to install the figures in the crypt, the sculptural details were in the hands of Franz Metzner (1870-1919). Metzner's work shows a distinct departure from the classical and romantic sculptural traditions; it is often associated with Jugendstil, the German expression of what we call Art Nouveau. 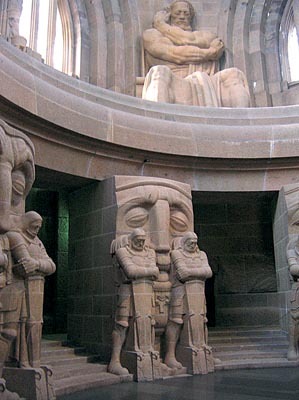 Whether or not this is stretching a point, these statues and masks certainly seem to presage early twentieth-century modernism. Apart from the 'great statues' in the crypt and around the cupola, there are literally hundreds of other figures and motifs that decorate the structure. The monument is a moderate walk from the centre of Leipzig, or you can take a no.15 or no.20 bus from in front of the central railway station (which itself is more than worth a visit). There is a very modest entrance fee which includes the 500 steps up to the viewing platform.